RVing is so exciting! You get to visit new places across the country and bring a literal home on wheels with you. On top of all that, RVing brings you a whole new language most of which you’ll have no trouble picking up along the way. Still, it’s nice to have some help getting started. Here’s a quick list of RV terms, slang, and jargon to help you on your first road trip! A site in an RV campground that must be backed into with an RV. Obviously not an actual basement. The outside storage of your RV. Some people call them bays, especially in a motorhome. Fifth-wheels and Class A motorhomes have the best storage, while a Class C usually doesn’t have much of a basement at all. Hands down, the grossest thing about RVing. Also, where your toilet waste is held underneath your rig. Learn how to take care of this tank properly here. Free camping where you are not plugged into any water or power source. 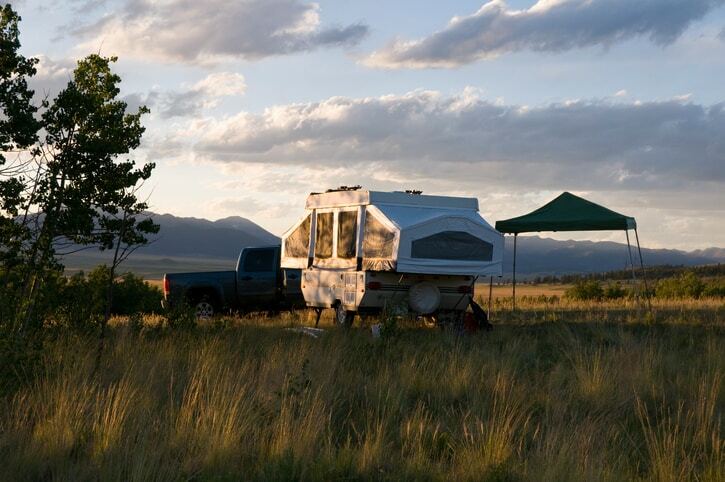 This type of camping is common out west and among full-time RVers. An electronic control unit inside the cab of the tow vehicle that controls the brakes of the trailer. The frame that your RV is built on. Just another word for a motorhome. A motorhome that has a diesel engine in the front. A motorhome that has a diesel engine in the back. This type of RV has a cult following and is known as the “only way to go” among certain RV circles. A truck that has two wheels on either side of the rear axle. These trucks are designed this way for heavy loads and towing purposes. Where you do the dirty job of emptying the tanks of your RV. Also called a weight-distributing hitch, this specialized hitch re-distributes a portion of the RV’s hitch weight to the axles of the tow vehicle and RV. Sometimes called a Jake Brake, this is a secondary braking system that uses the engine’s exhaust to help slow down the vehicle. It’s fairly common on large vehicles like Class A motorhomes. This acronym stands for Full Hook Up. A full-hookup site is one that lets you plug into electric, water, and sewer connections. This is the holy grail of campsites, my friends. A cutesy term for fifth-wheel. This refers to a fifth-wheel where the living area is in the front instead of the bedroom. This water tank holds all of the water you can use for drinking, cooking, and showering. It comes in handy when you’re boondocking. 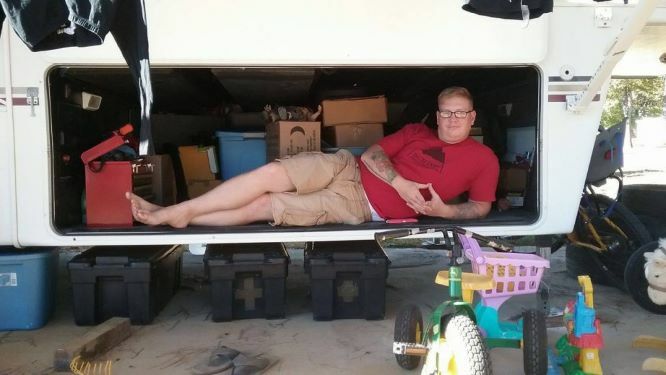 People that live in their RV full-time. Yes, people really do that. Including me and most of my friends! This is just a fancy term for the kitchen or main section of your RV. The black tank’s less disgusting cousin. Where your dirty sink and shower water goes. Where your sewage and dirty water are held. Most RVs have at least two holding tanks; one for your toilet waste and one for your shower and sink water. 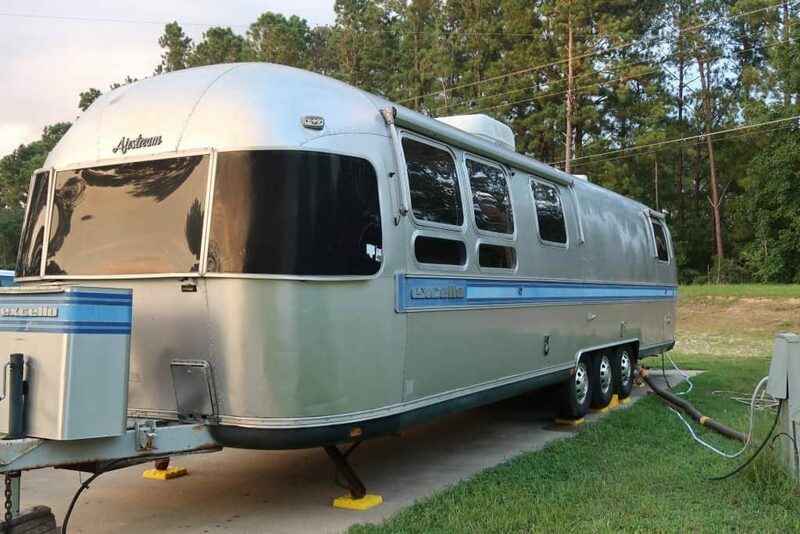 Larger fifth-wheels may have a third holding tank that separates the shower and sink water. Not as pleasant as it sounds. A mobile tank (that can be moved by truck) to house your sewage. You need this when staying at a campsite without FHU. Some campgrounds offer a honey wagon as a service so you can empty your black tank. Systems your RV can “hookup” to, including water, sewer, and electricity. Converts 12 volt DC power to 110 volt AC power. The round, cylindrical piece hanging down at the very front of a fifth wheel trailer. 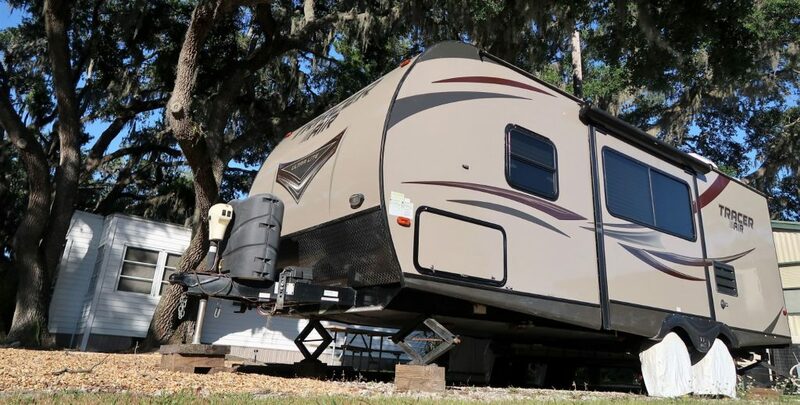 It connects to the jaws of the fifth wheel hitch to the back of the tow vehicle. Liquid petroleum gas, also known as propane. 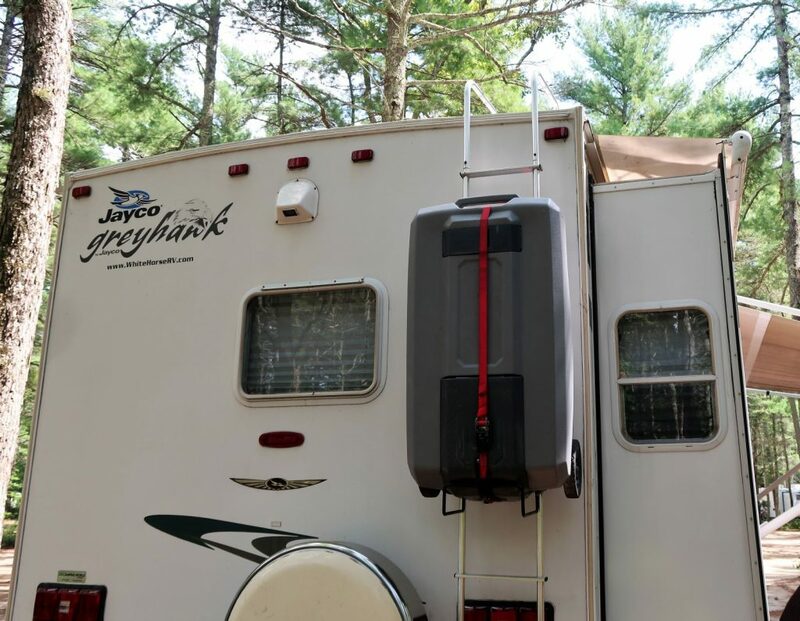 Having the right RV jacks will make sure your RV sits level on the ground. Also known as Driveway Surfing, this simply means you are staying in someone’s driveway. You can be hooked up or not. Any RV that doesn’t require a tow vehicle. 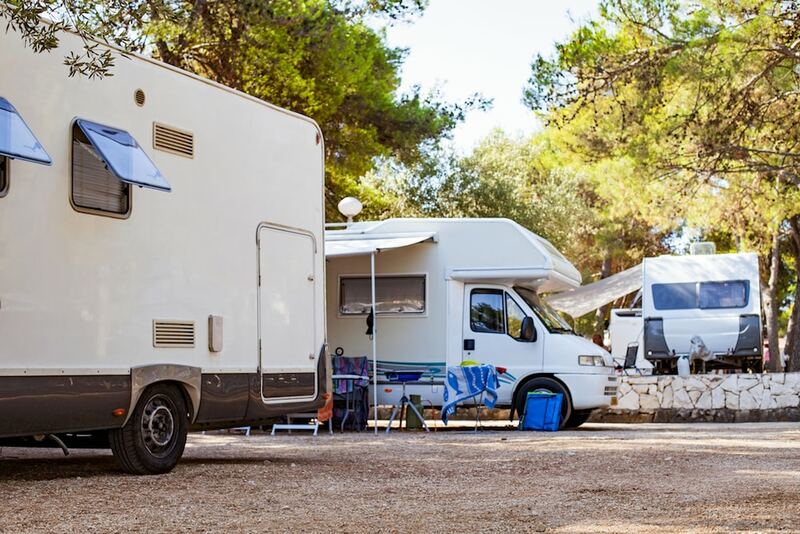 Some parks have designated areas of the campground to park RVs when they are full. The lot usually has no hookups and limits on your length of stay. An RV meant to be parked in one place and rarely (if ever) moved. They are a bit like tiny homes, but usually bigger. Wildly popular in south Florida campgrounds. A campsite with easy access and departure that will allow you to set up and leave without ever having to back up your rig. This camper is soft-sided and folds down into a compact square or rectangle for transit. Once parked, it expands into a camper. Slang for RV. People use this no matter what type of RV they have. An electrical power hookup at a campsite. A generator doesn’t count. It has to connect you to the power grid. 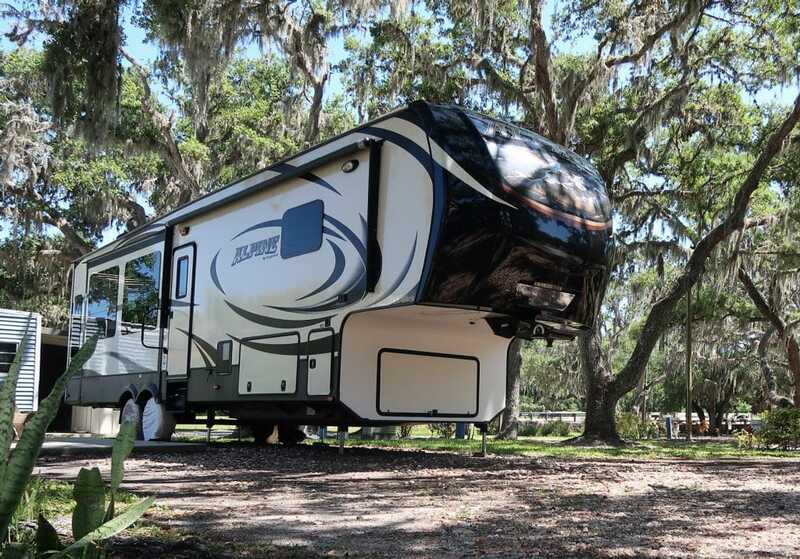 Part of your RV that literally slides out to expand the floor plan, providing you with more living space. Some people call these pop-outs (not to be confused with pop-ups). This a fun term for people who travel south for the winter, and go back up north in the summer. They are often found in Florida, Texas, and Arizona in the winter but commonly call Michigan, Minnesota, and Canada home. Found in pop-up campers and expandable trailers these are walls made of vinyl or other foldable materials instead of the standard aluminum. This is the term some RVers use for the black tank sewer hose. This is a cute term for the vehicle you tow behind your motorhome. It’s also often called a dingy or tow vehicle. Honda CRVs are extremely popular as a toad, as well as the Ford Focus. But in my humble opinion, the Jeep is the one toad to rule them all. Set by the vehicle manufacturer, this is the weight your vehicle can safely tow. 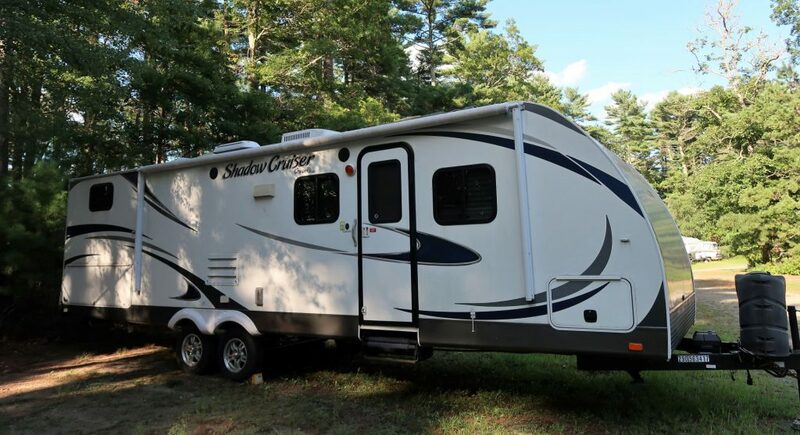 An RV that has a garage space for dirtbikes, motorcycles, ATVs or some other type of small motorized vehicle. An RV that’s designed to slide into the bed of a pickup truck. Some are larger than others and some even offer a pop-up-camper-like top. A commonly used abbreviation for a travel trailer. The bottom of your RV. This is where your tanks are housed. A term used when spending the night in a Walmart parking lot. Yes, people do this. Not every Walmart allows wallydocking so be sure to check for signs and always go inside to confirm with a manager. Slang for someone who typically RVs on the weekends or during holidays. Working for a free campsite. It can also include your utilities and a small wage. 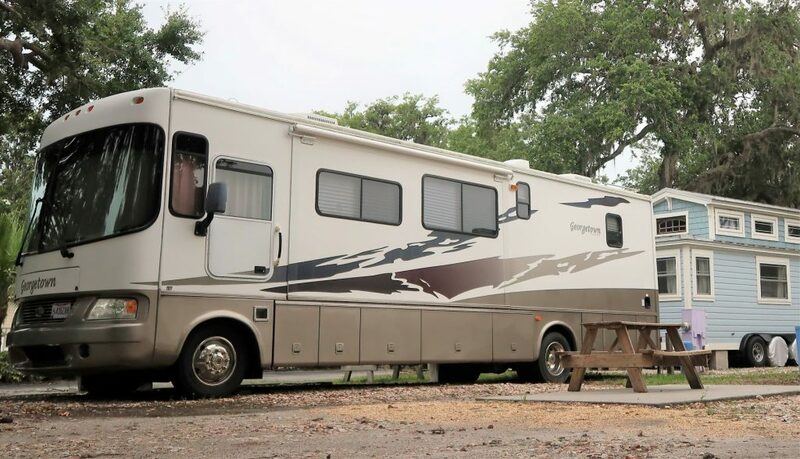 This is very popular among full-time RVers to cut living costs and stay in a popular area at little to no cost. And there you have it! Your A-to-Z list of essential RV terms to help you get started with your RV adventures! Thank you so much for the jargon interface. I see something there I would have on my list from the start, ’cause i’m a mechanic, but most wouldn’t think of. That is the tool box. I think, from past regular vehicle experiences in my younger life, that mine would be about 3 times that size since I am a mechanic. And since I am a mechanic, do you have a heated shelter for the unusual long repairs, like in snowbank situations, (space heater included)? I haven’t gone through all your items but will, but if you haven’t addressed the specifics like how much to save for repairs I would be interested in aven a general idea. You have a large home, compared to what I was thinking of, but I have a friend who has this and had trouble hooking up the septic so it would drain because it was too high even though they had the same support system you have. Is there a law or regulation for how high the drain hookup can be? Or how high can you jack up the home? Also, I have thought about the free camping thing but wonder how I would operate a 12 volt pump for water. How much solar or battery storage seems sufficient for your needs? As I stated, I didn’t have time to go through all you listed here, (and there are no links to click on for more info. Sorry for being so wanting of all info at once. ), but I will check all you have here out and get back to you with further questions. Again, Thanks for all you have given. Lol I knew most of these not the Wally World one tho. I call our toy hauler our rig too funny. I did enjoy thos post should be info that comes with your rig new or used. Hi Liz, As full timers, we enjoy your posts. While we’ve covered the country, we tend to stay east of Texas, where our daughter lives. We volunteer at state parks and COE parks, usually between the Florida panhandle, and Vermont. We were half time for 5 years, and full time for 4 . We started in a 31ft TT and now on our 2nd fiver, a 37ft. 3slide Chaparral. We hope to run into you somewhere. Keep up the fun posts, and holler if we can help. Leveling Jack’s are to keep rigs from being tippy when moving around inside, to level a trailer use the front jack and if you have to, sometimes you drive one side up onto leveling pads or pieces of wood. Do not over extend the 4 corner Jack’s or lift the rig using the corner Jack’s, they are not made for that.